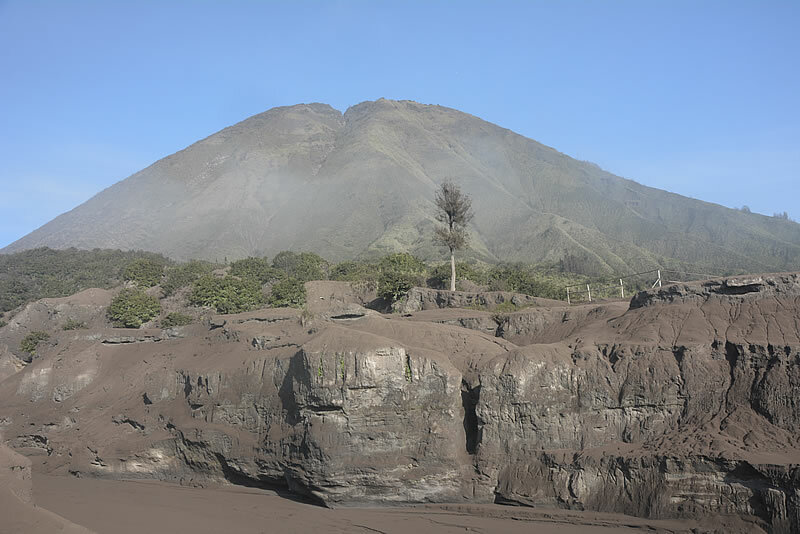 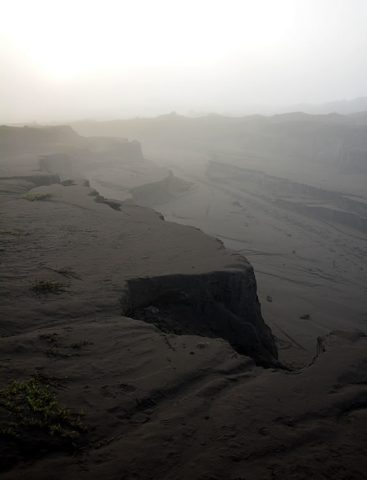 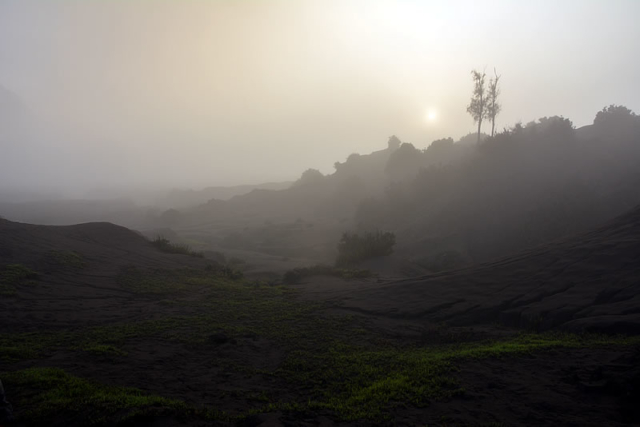 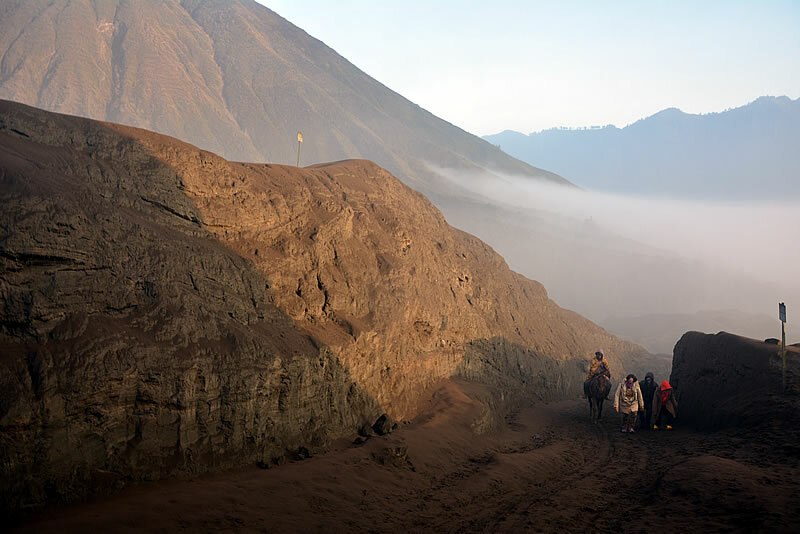 After speaking to other travellers who had done the hikes we decided to avoid the crowds on jeep tours at the lookout point and make our way across the “black sand sea” to Bromo itself for sunrise. 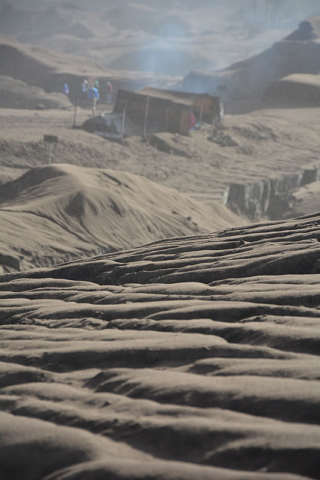 The National Park fees for foreigners were steep to say the least at 900k/$70 for all of us for one day only. 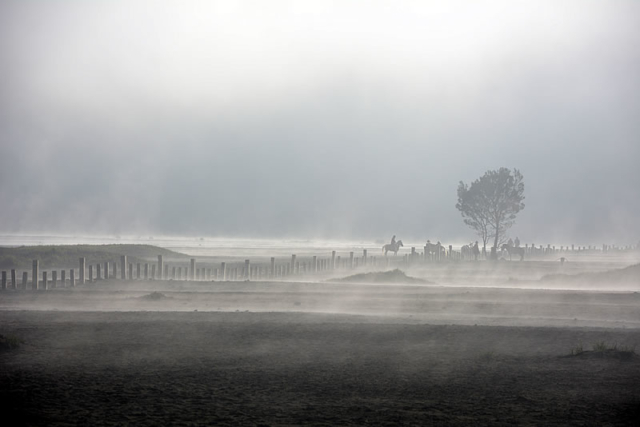 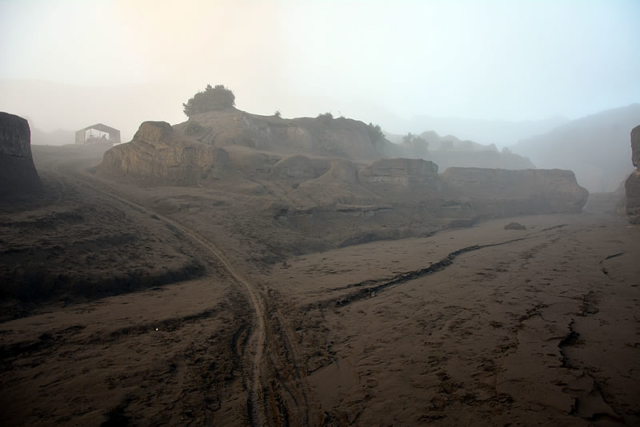 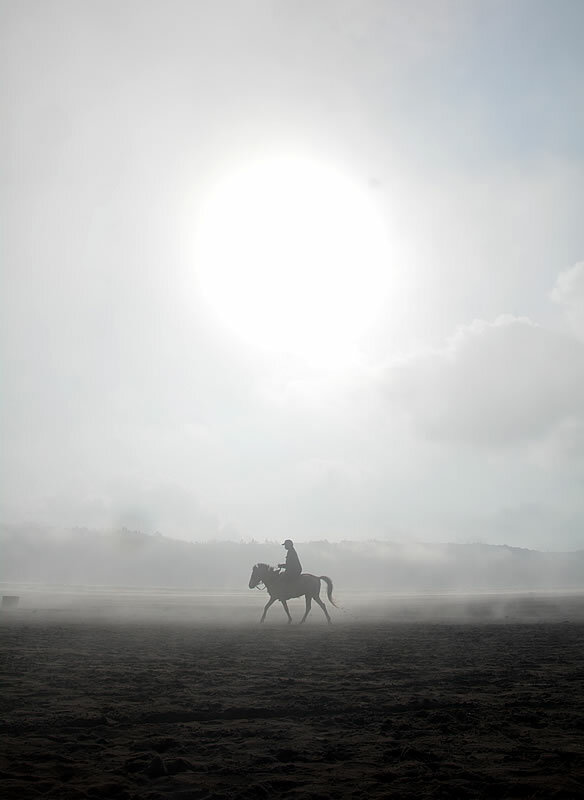 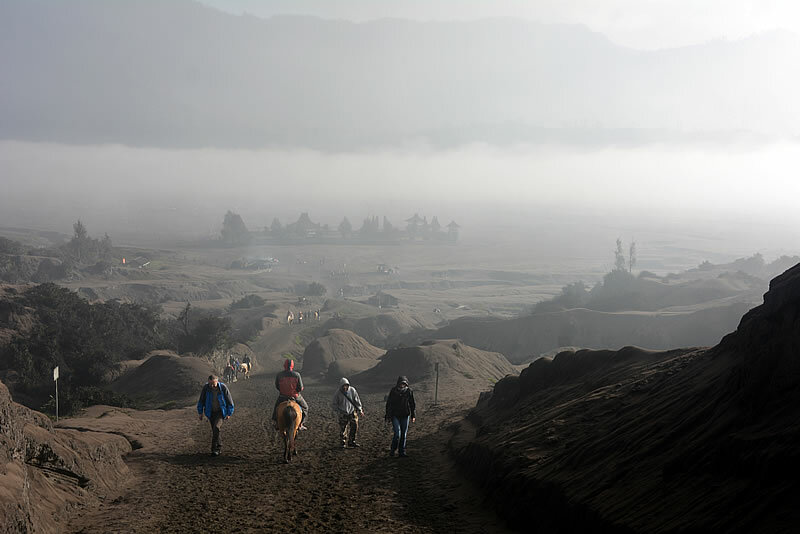 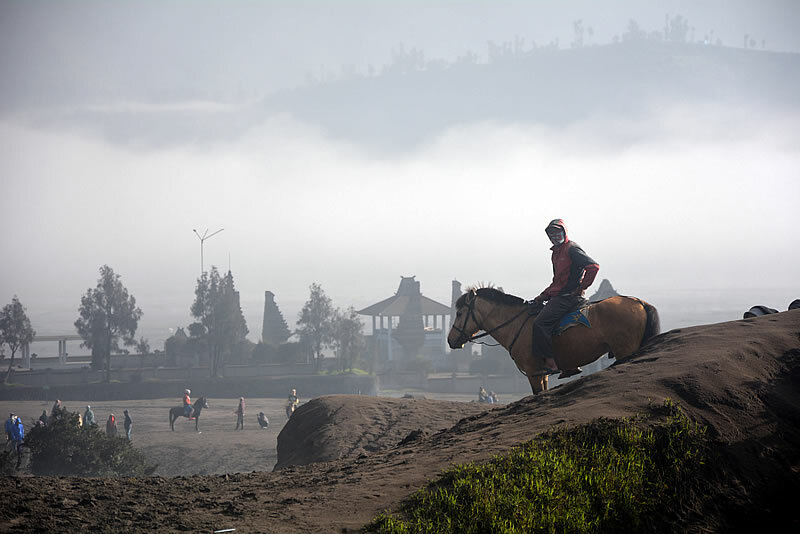 We’d heard rumour of a horse trail near the Cemara Indah hotel that lead down to the plateau of the Tengger Caldera and avoided the park entrance, so at a dark and sub-ten degree 5 o’clock the following morning found ourselves scrambling down it by torch-light in heavy rented jackets. 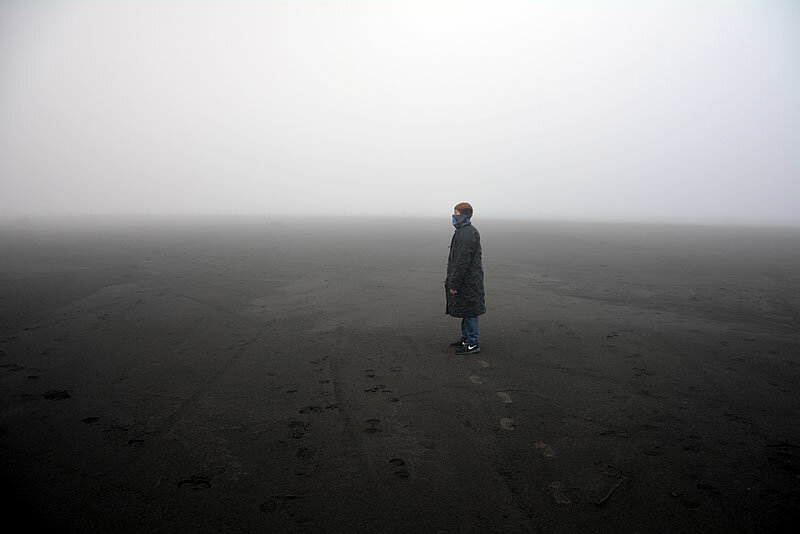 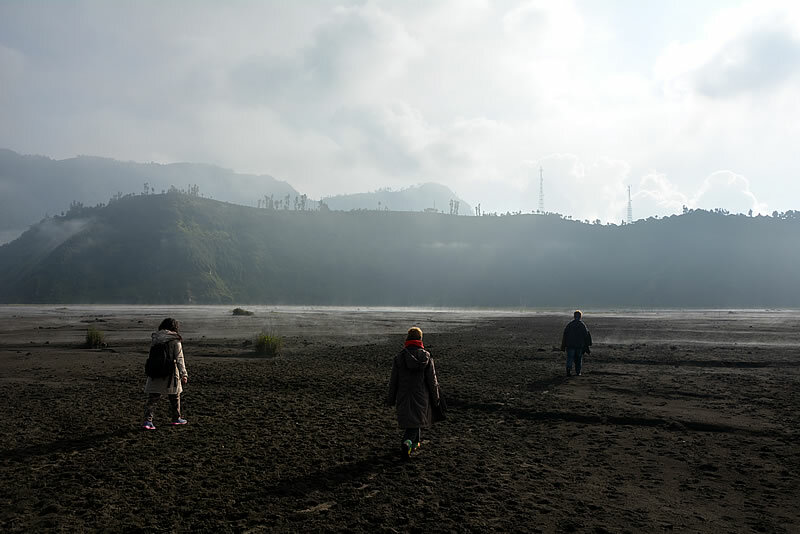 Once we reached the bottom a white wall of cloud and mist that filled the vast crater met us, our only indication of direction was the rumbling of Bromo a couple of kilometers away so we headed for that hoping that we didn’t bump into any park rangers looking to inspect tickets. 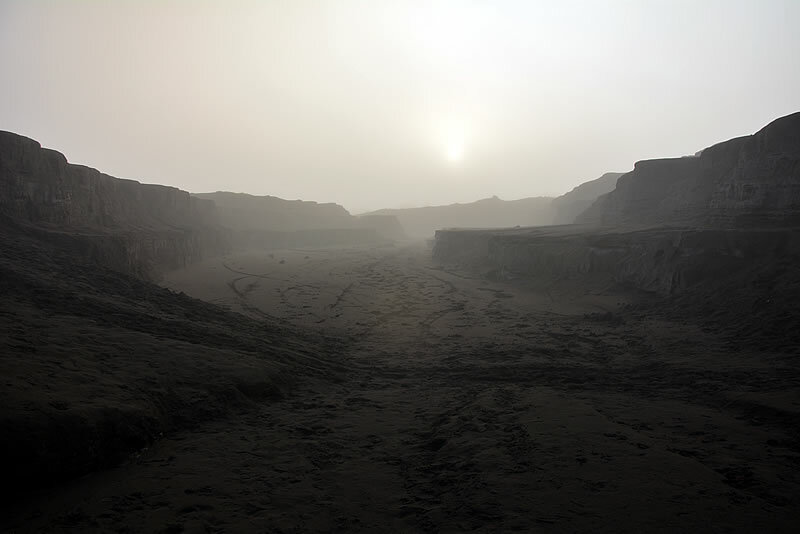 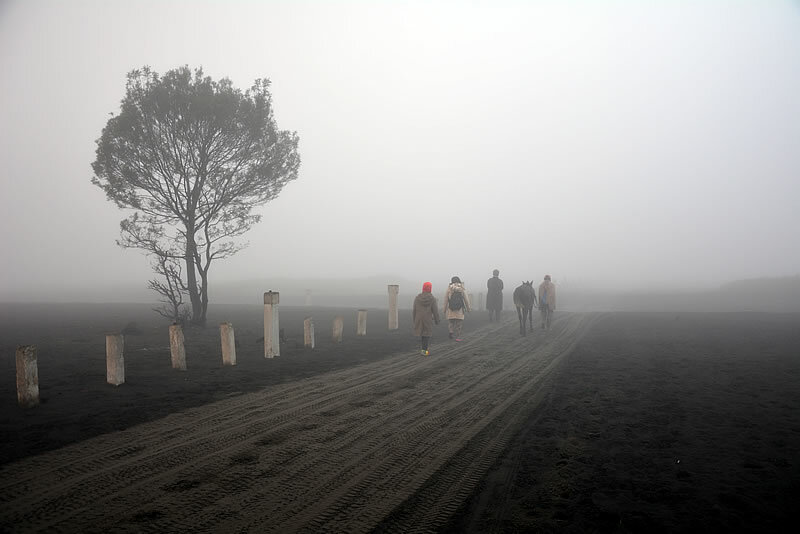 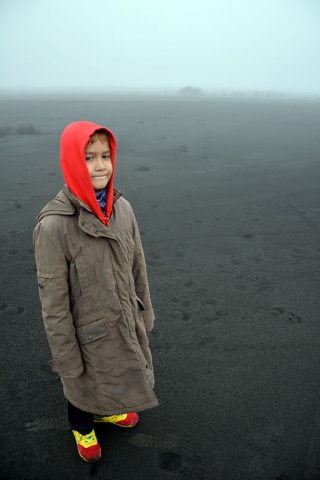 We trudged on across the vast black desert through the mist like some kind of post-apocalyptic survival journey. 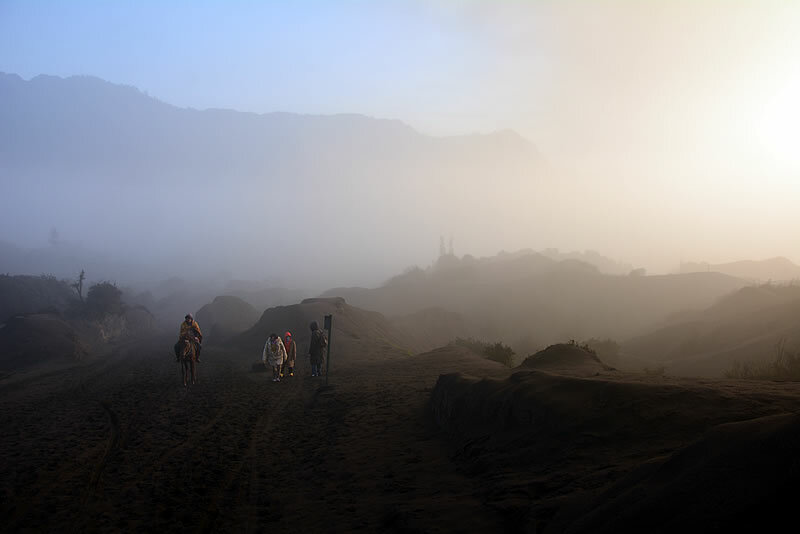 Nearing the volcano as the mist began to clear we started getting covered in fine black dust in the form of ash which got into absolutely everywhere. 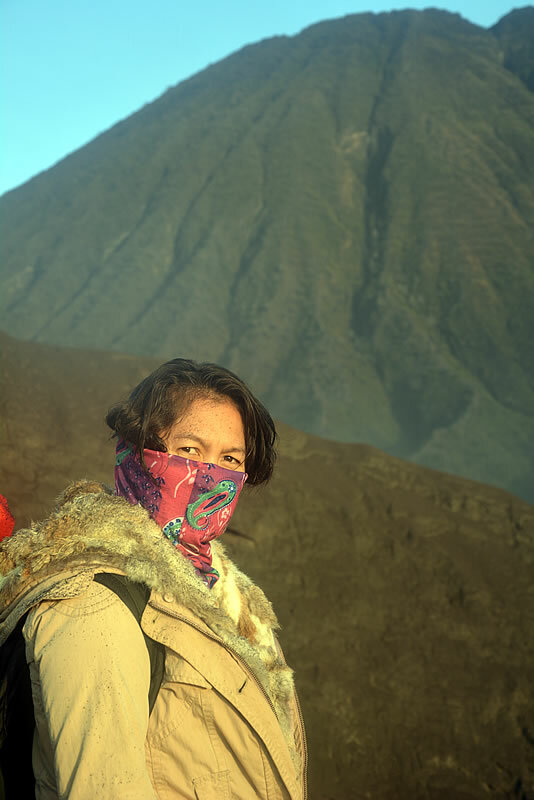 Breathing became tougher as we climbed and the going got slower, maybe a combination of the increasing altitude and the black blizzard. 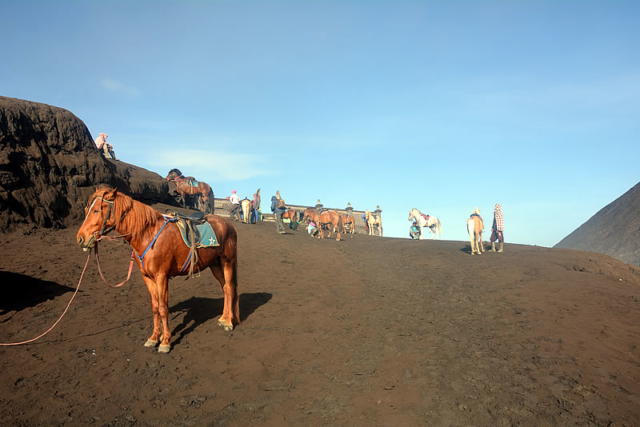 Horsemen offered us rides but I was determined to make the summit on foot, mostly at the objections of the clan – it wasn’t a tough climb, it just felt tough. 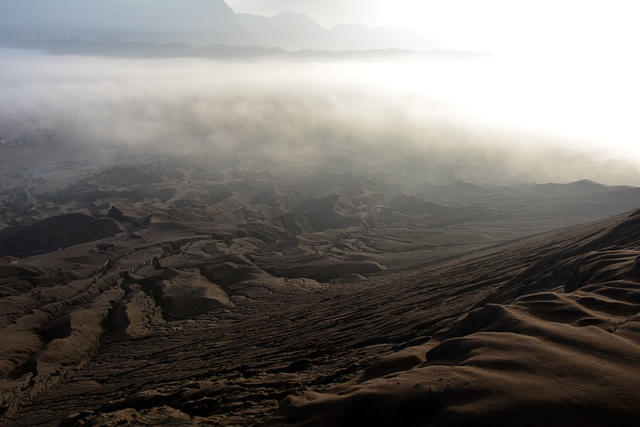 The landscape was almost lunar in appearance, or that of some far distant alien planet, it certainly bared no resemblance to anywhere familiar on this one. 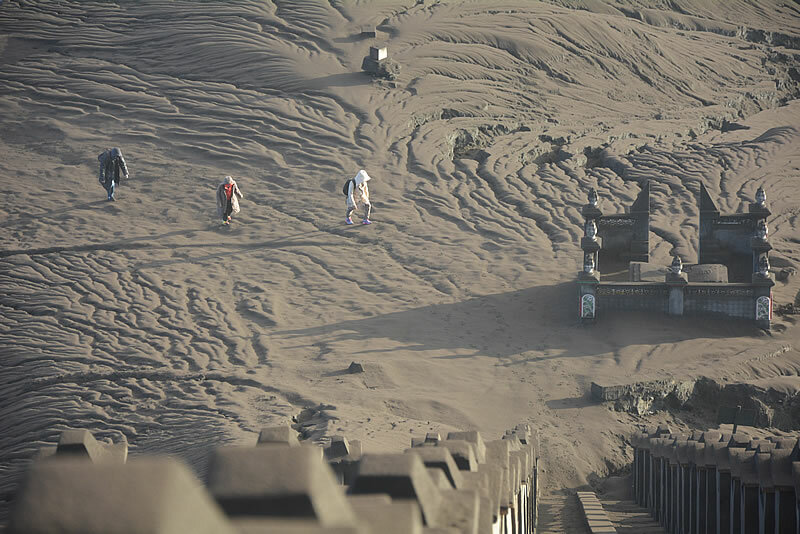 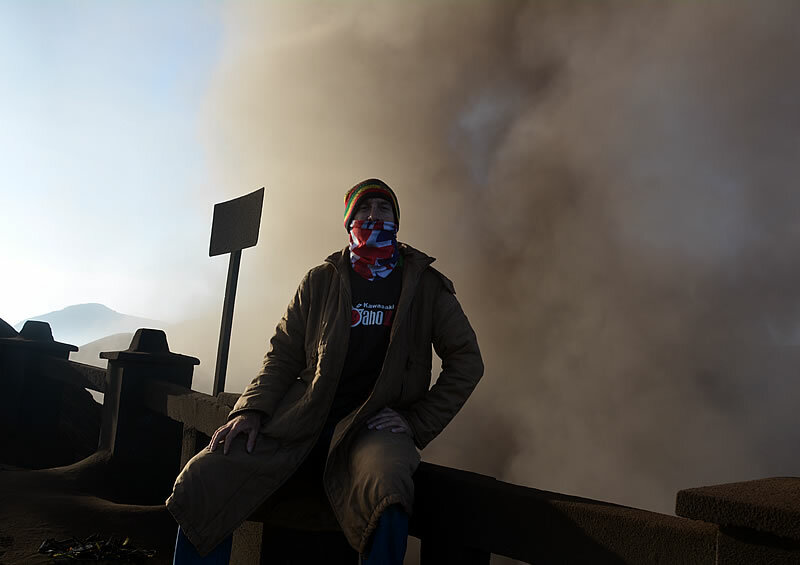 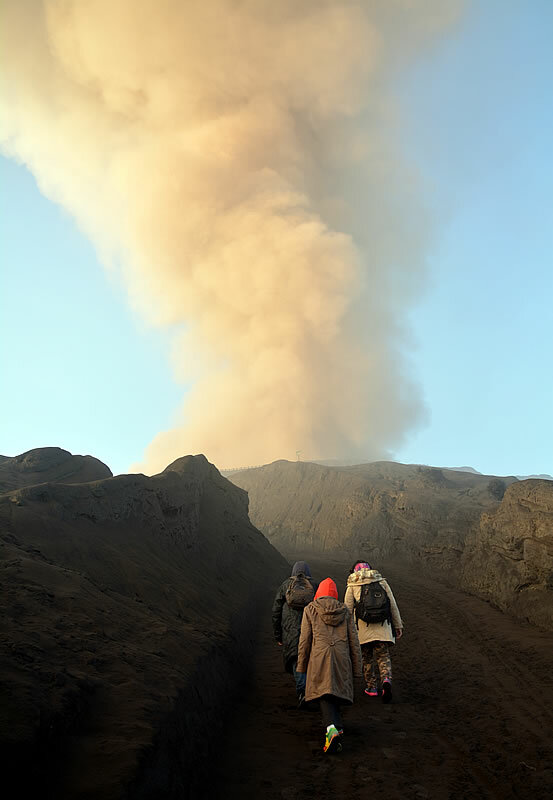 We reached the stairs signifying the final ascent to the crater rim, 242 steps above us a huge plume of super-heated ash billowed into the crisp morning sky accompanied by the deep reverberating growls of the Earth. 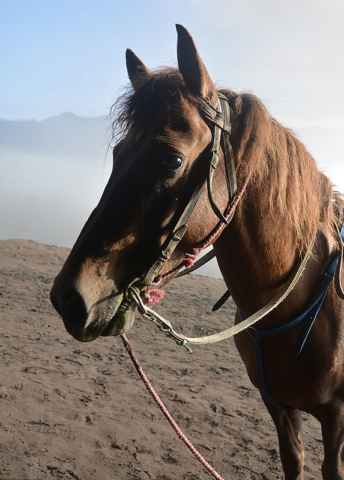 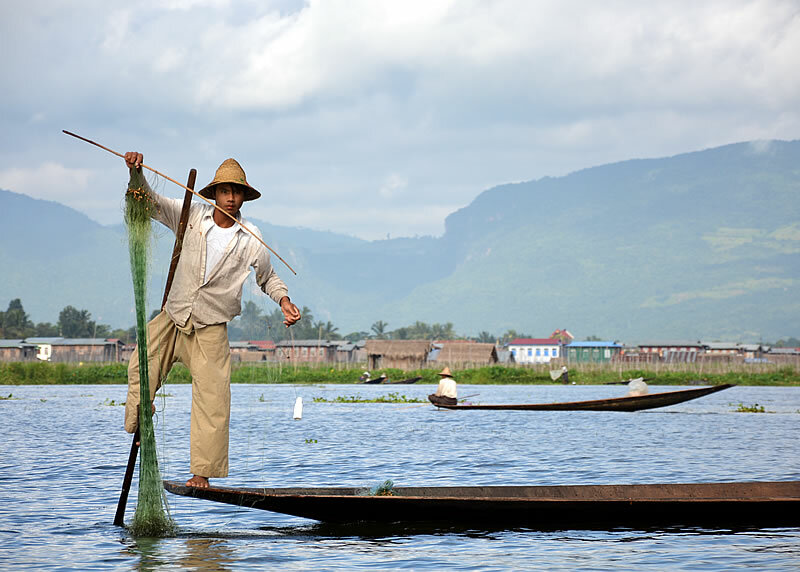 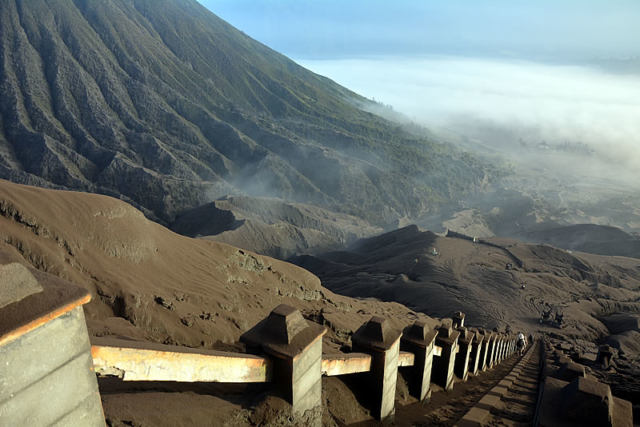 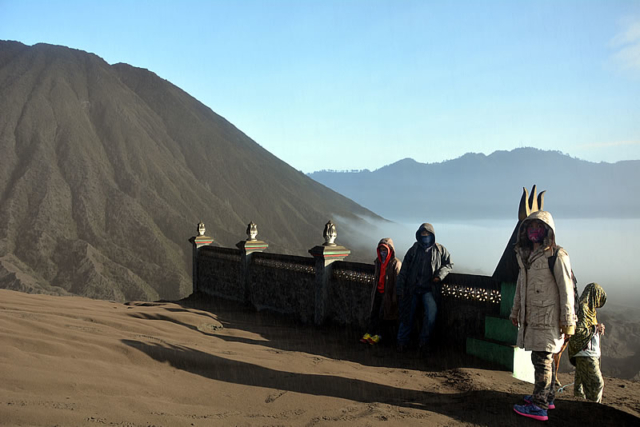 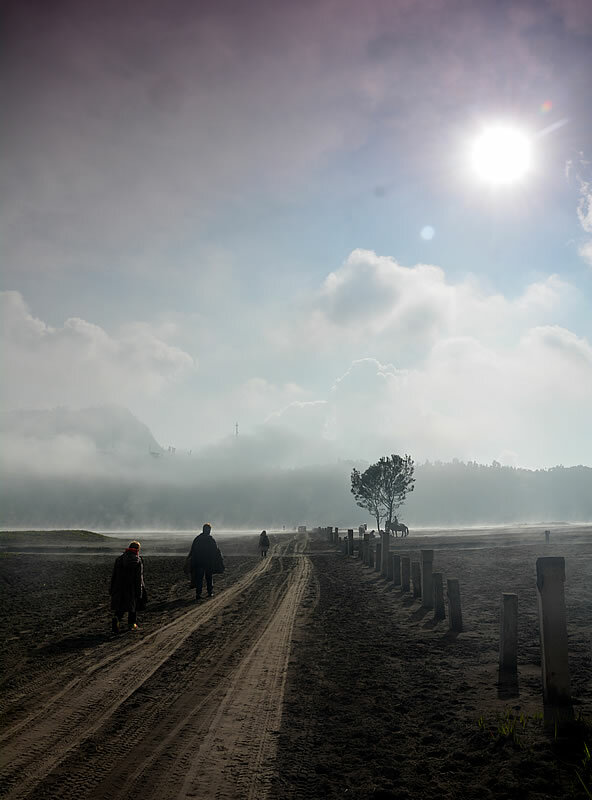 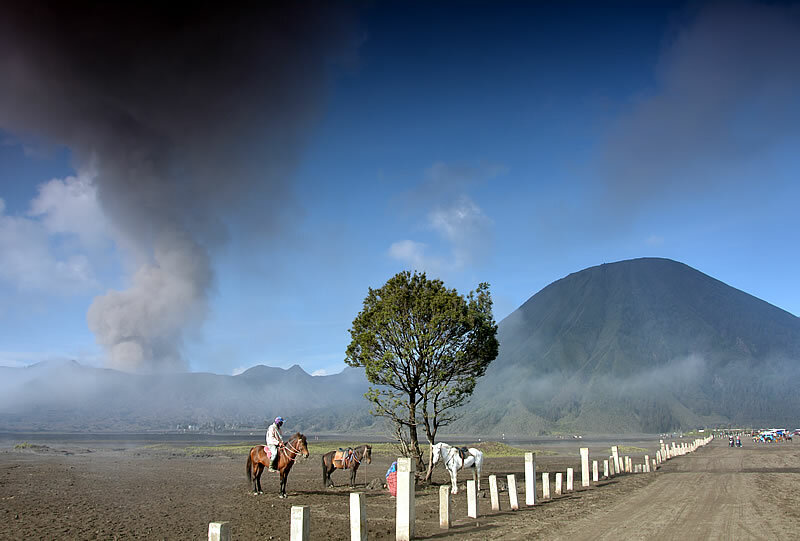 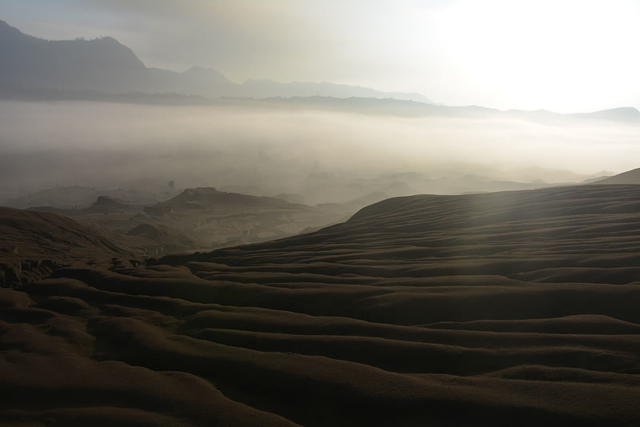 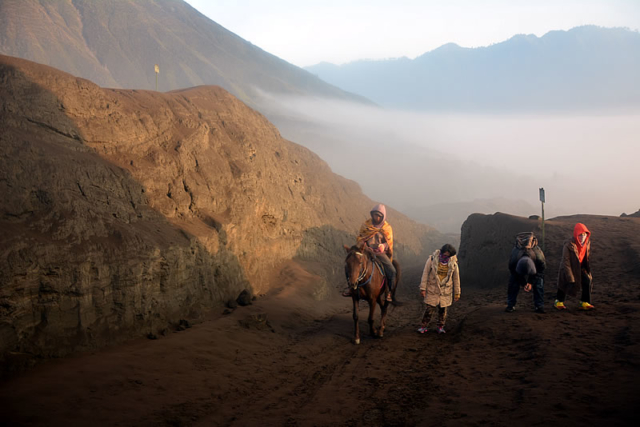 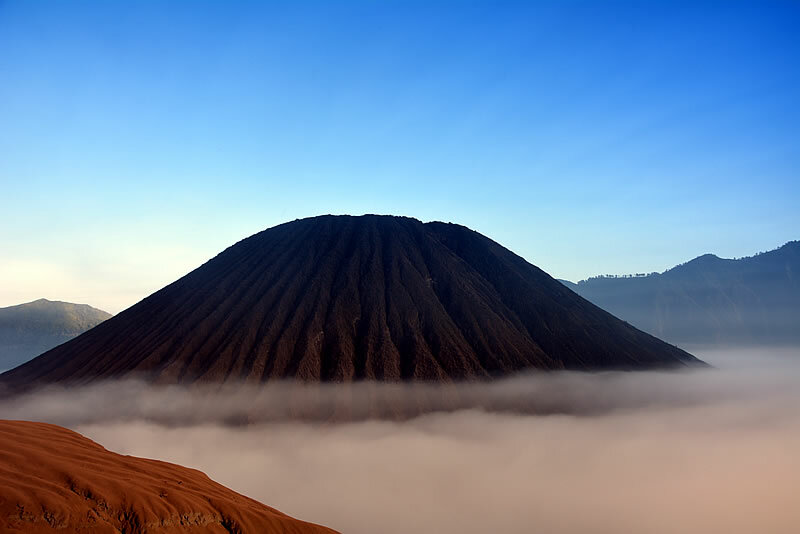 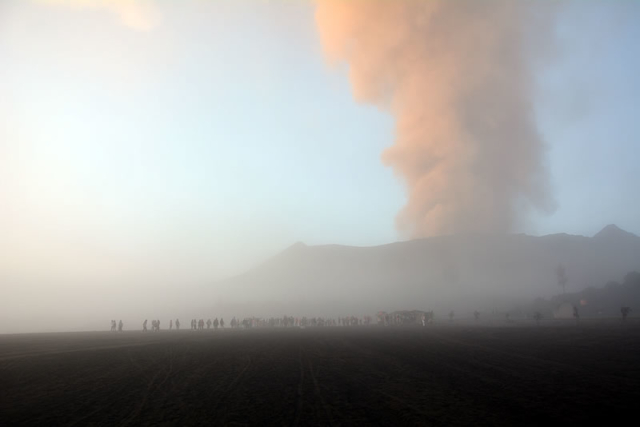 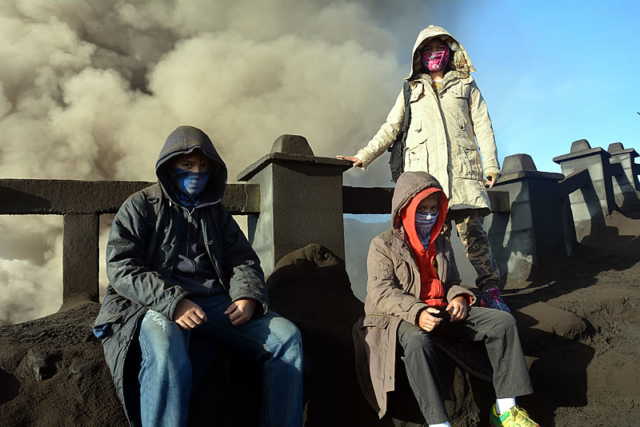 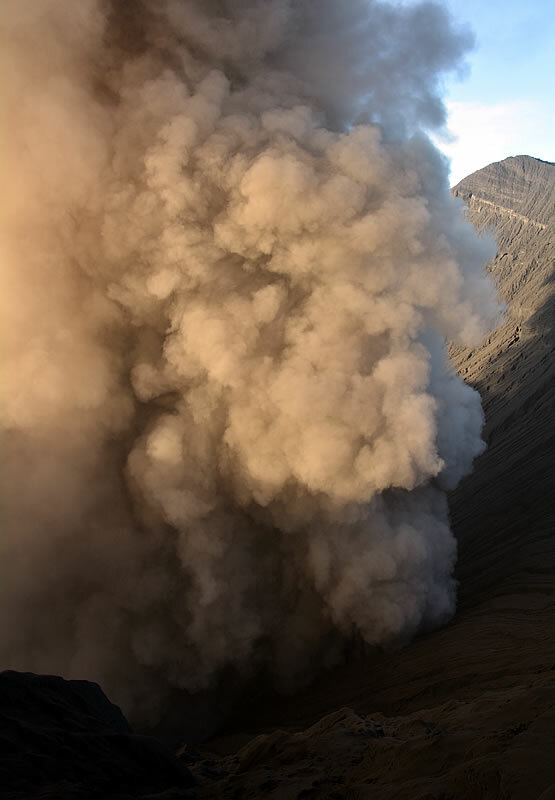 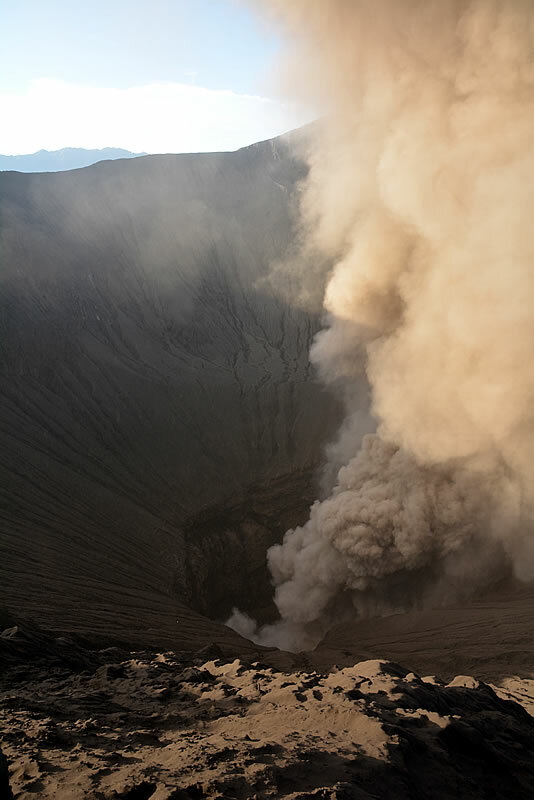 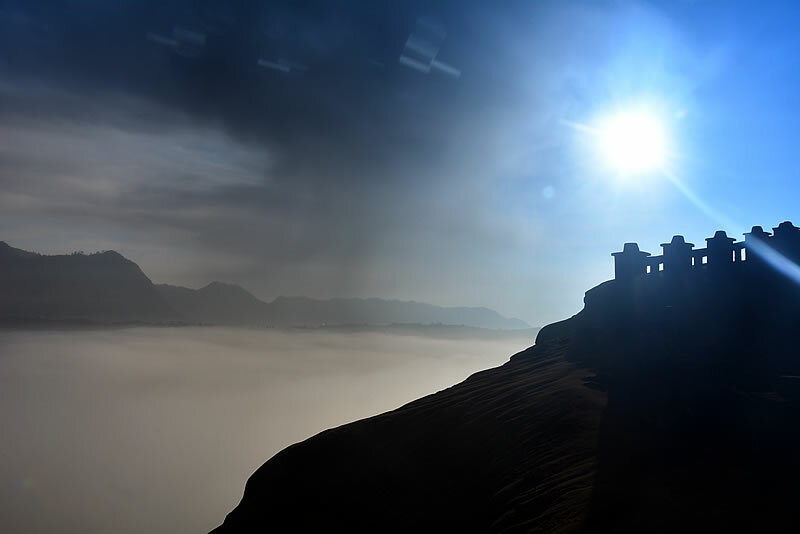 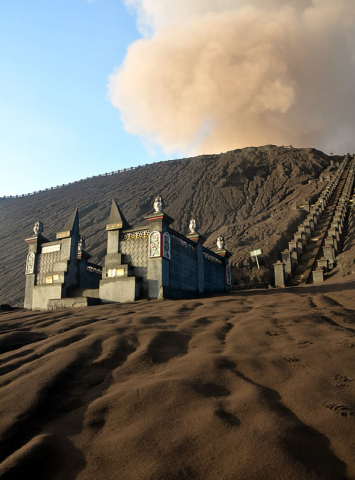 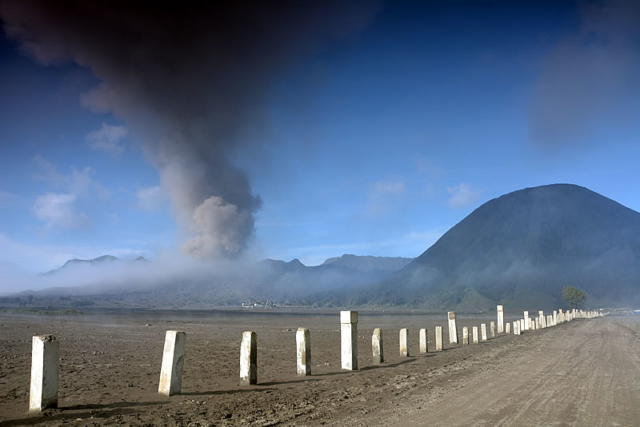 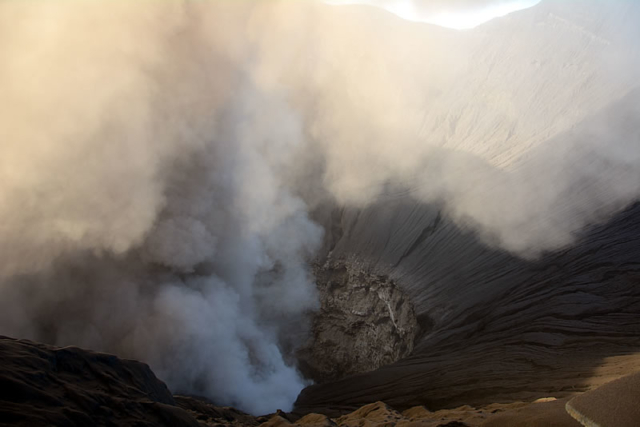 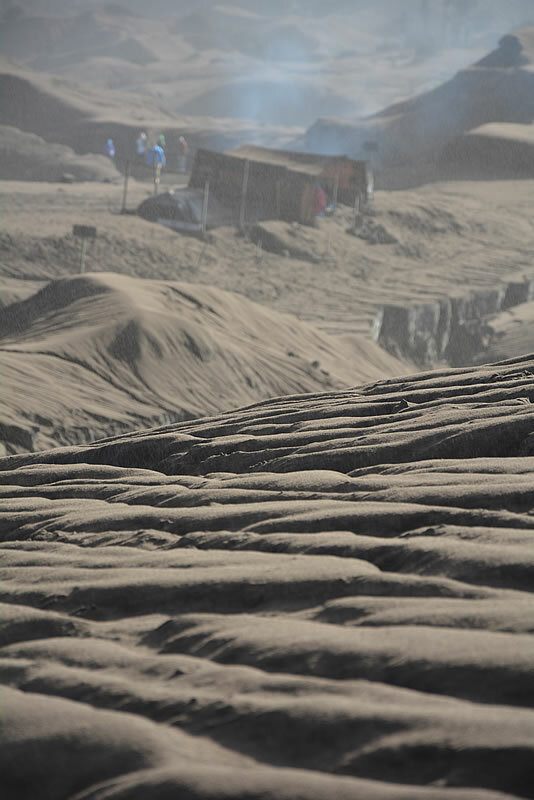 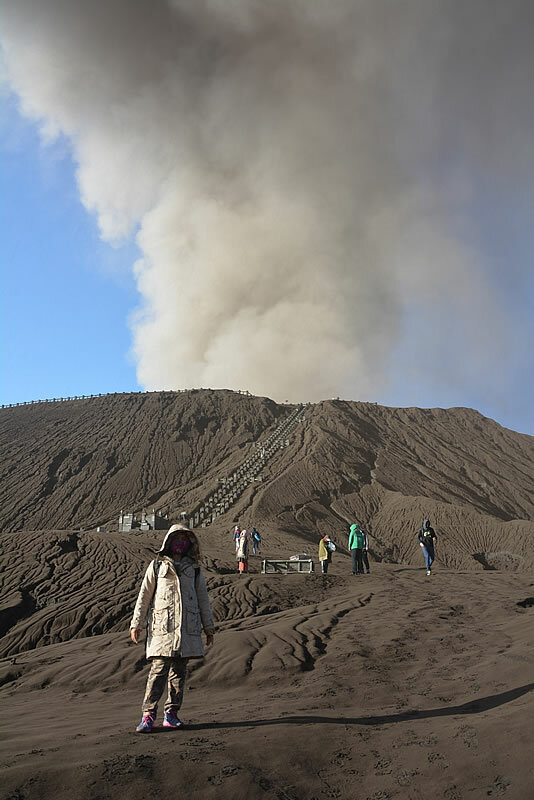 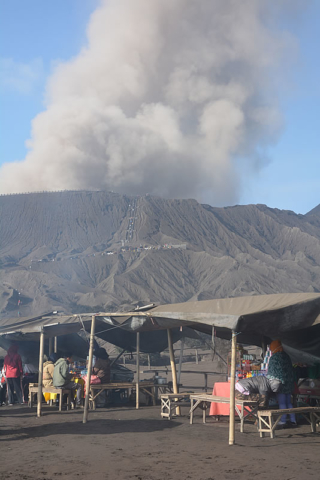 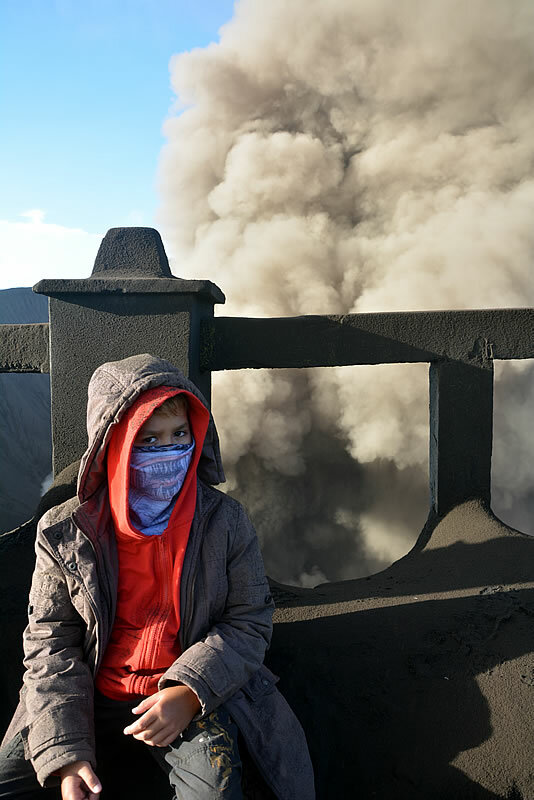 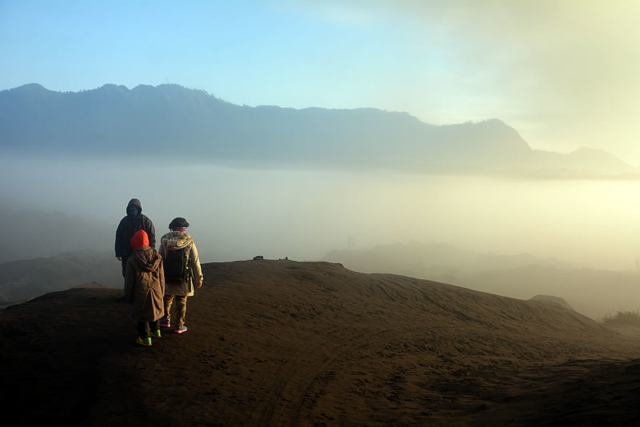 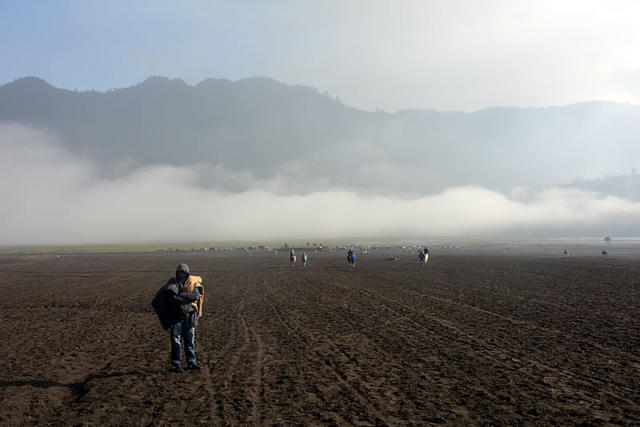 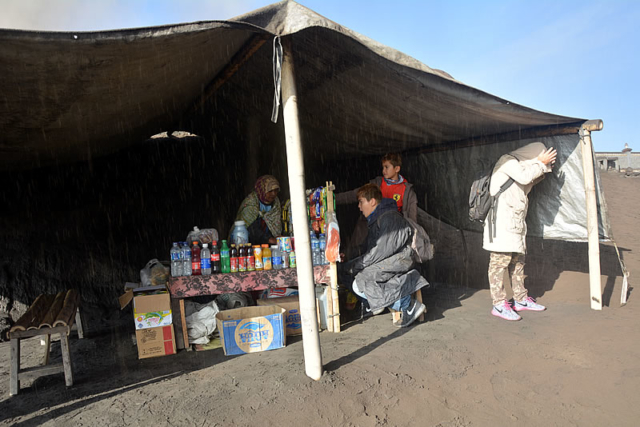 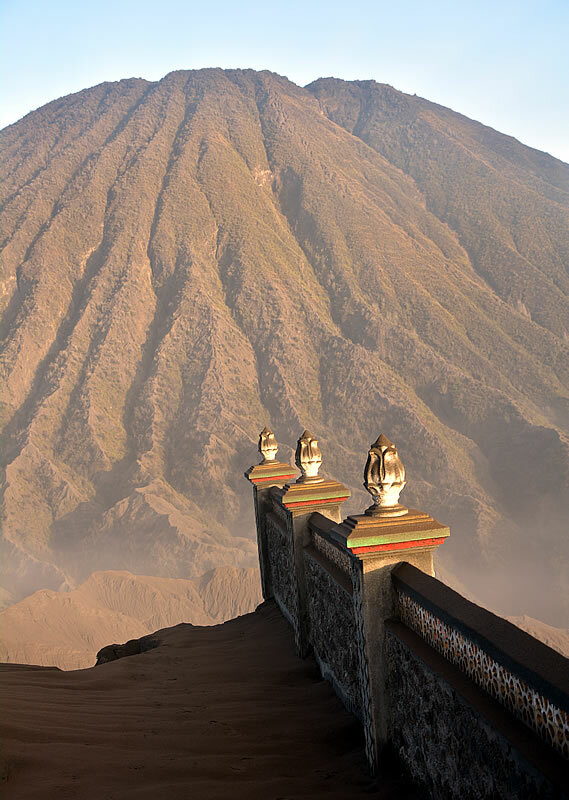 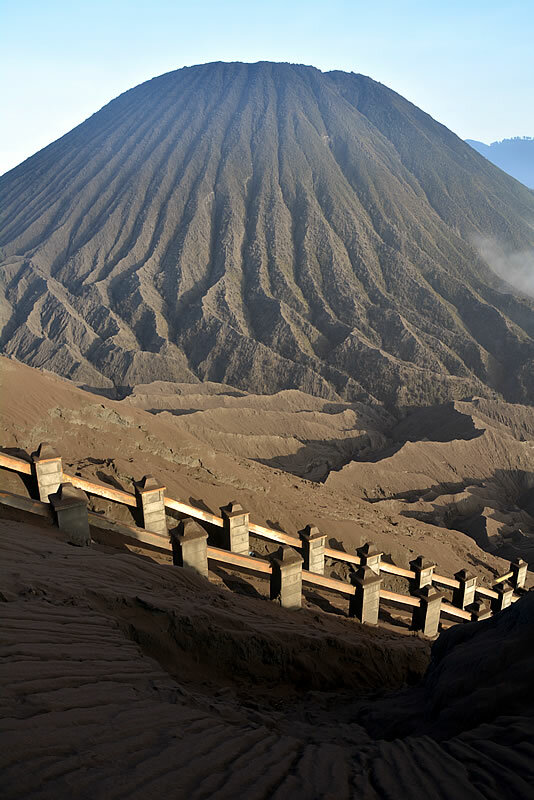 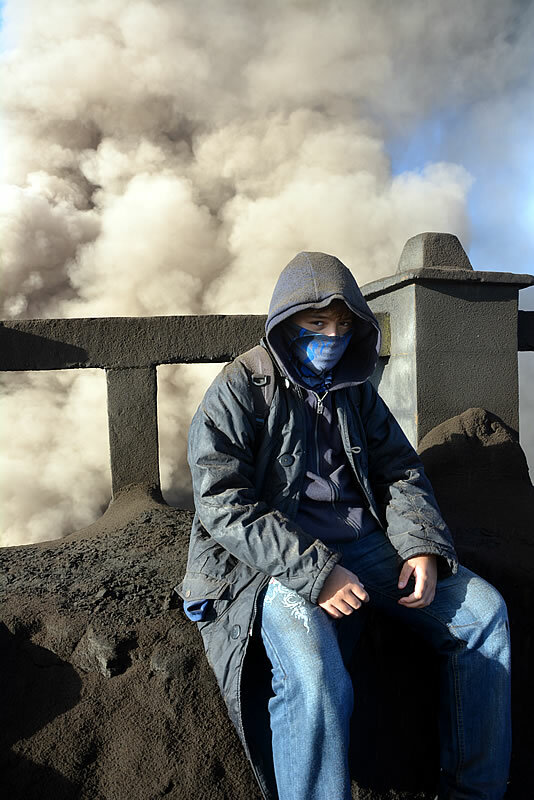 There is an unspoken connection and a mutual nod of respect between travellers when they reach the crater rim of Bromo, peer into the rumbling belly of the beast, and simply utter the word ‘wow’! Like the Sarlacc Pit in Return of the Jedi this place seemed to be alive; you could feel the planet breathing beneath your feet. 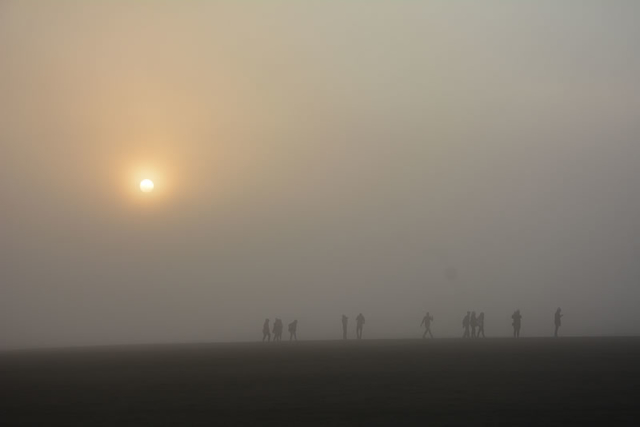 At this time of morning there were only the odd one or two others up here, the rest were still at the viewpoint or were too apprehensive to make the climb. 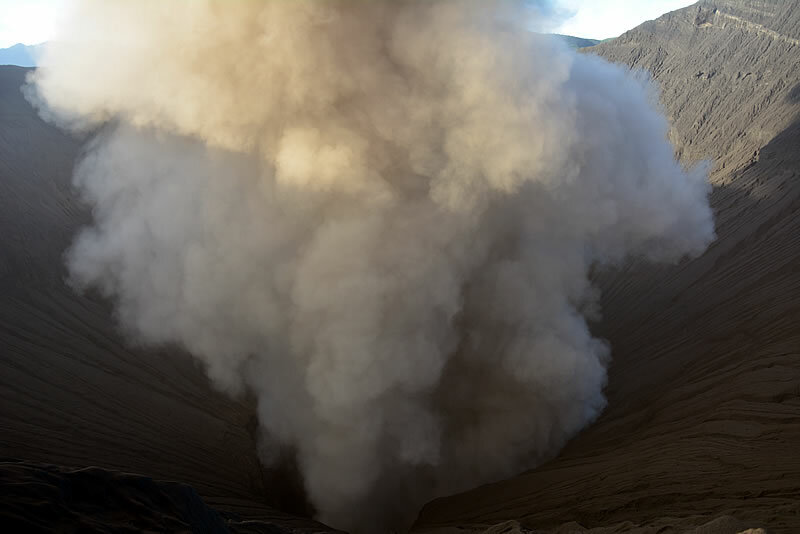 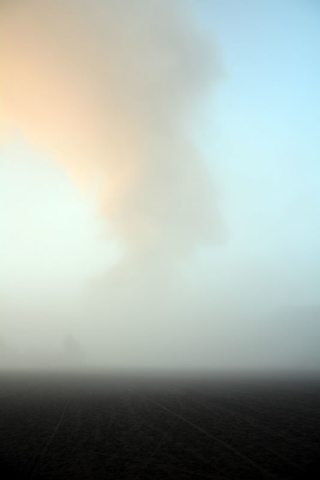 The sheer power and sound of the ongoing upsurge of volcanic gas was awe-inspiring. I took as many shots as I could before the Nikon became clogged with ash and unusable, it was time to get off the rim and head for a small makeshift shack selling coffee I’d spotted on the way up. 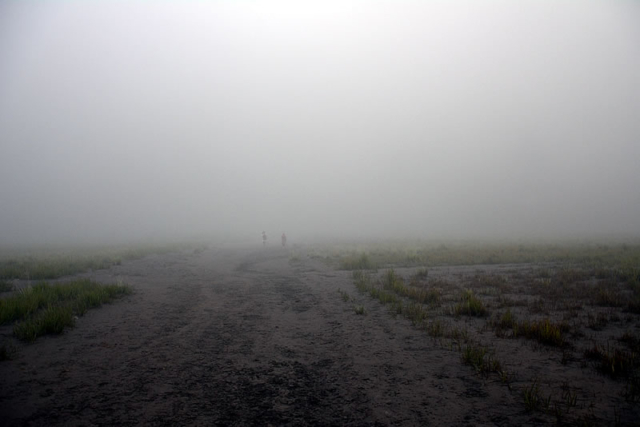 We headed back in the same direction which by now was clear of low cloud and beginning to fill with jeeps, and tourists. The kids took horses as they were starting to get fatigued, I was still running on pure adrenaline! 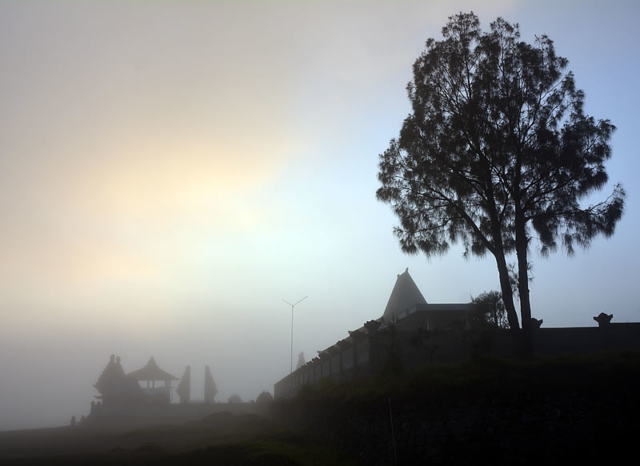 By 11am the rain and cold clouds had returned to Cemoro Lawang and the visibility was back to 50 meters or so, if it wasn’t for the distant thunderous rumbles you would never have known what was out there. 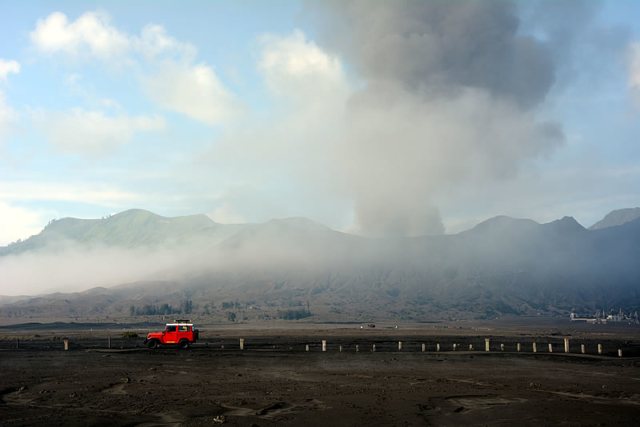 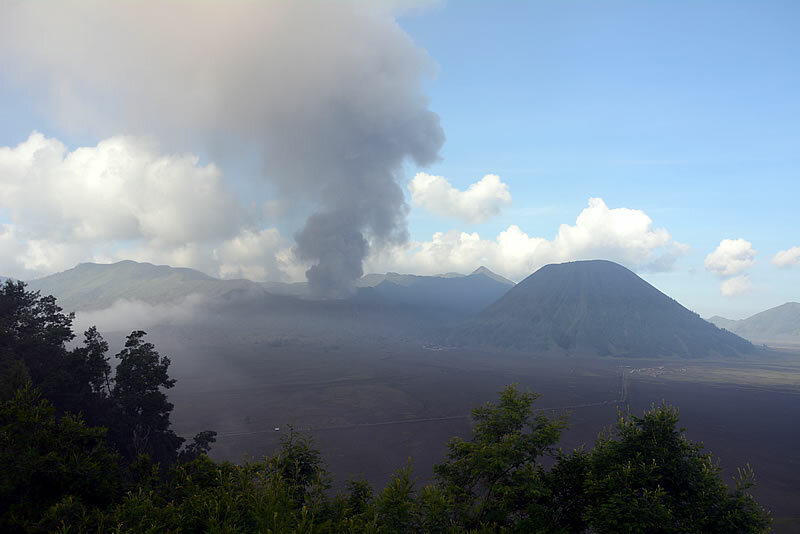 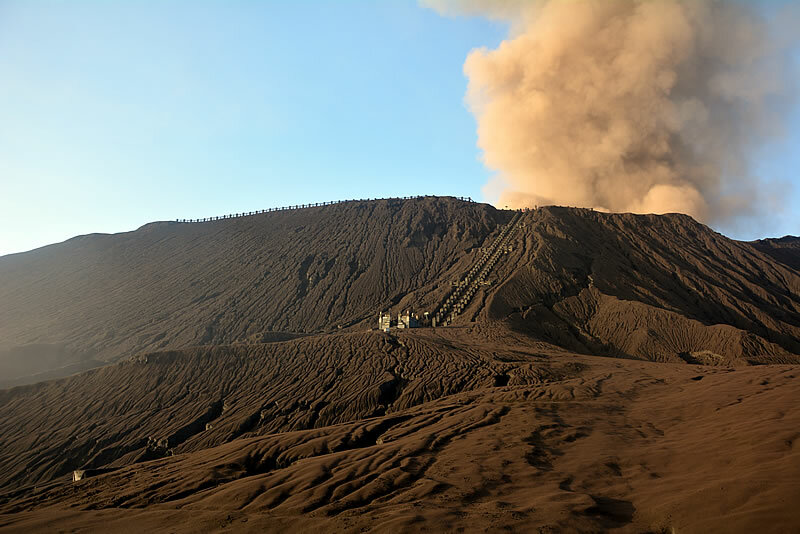 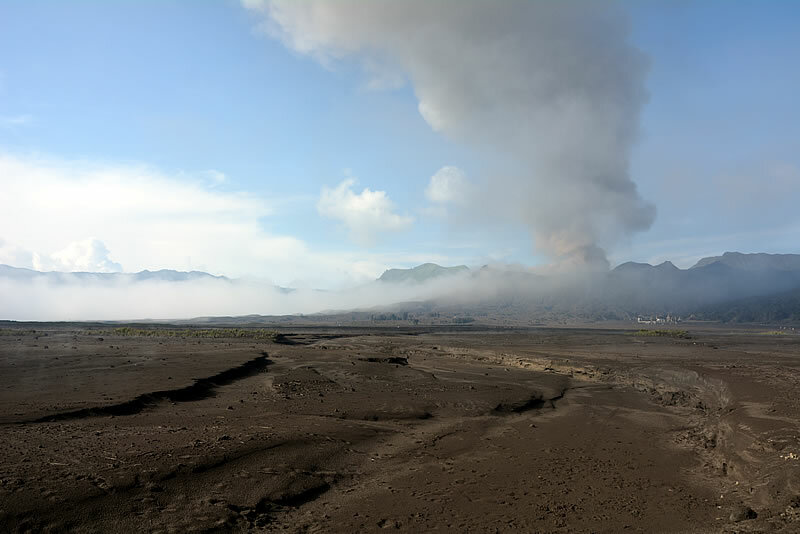 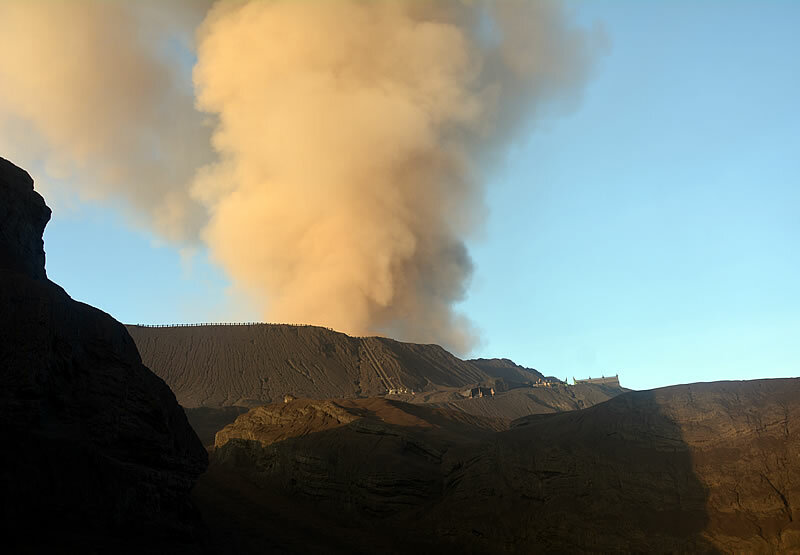 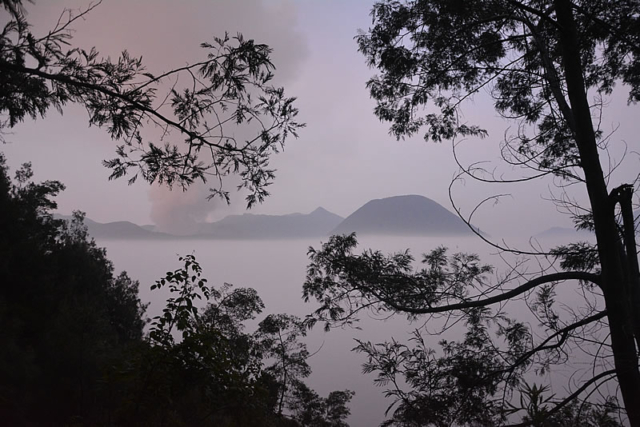 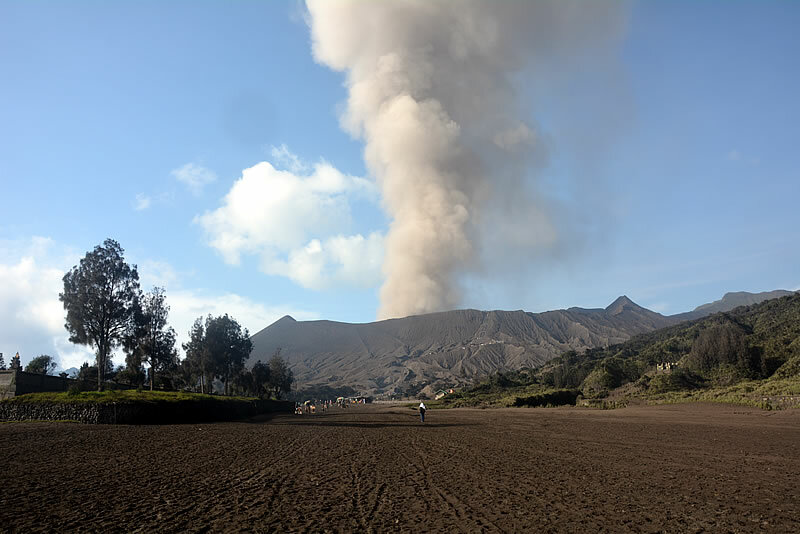 By 5pm it had cleared across the caldera and we were treated to a fading sunset and the ongoing show from Mount Bromo as the temperature dropped and night closed in.